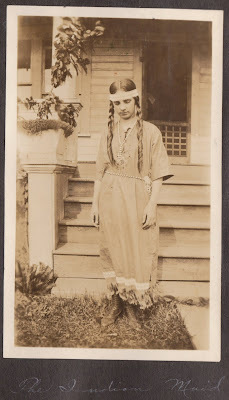 Just recently we photographed two Camp Fire Girls uniforms that we have in our collections. 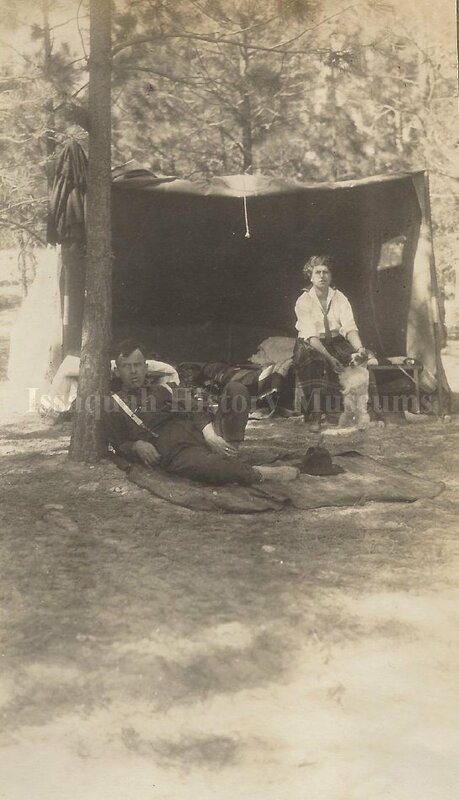 Our research for Local History Month of Josephine Cornick Ross, Minnie Wilson Schomber, and Ferol Tibbetts Jess landed us with a common thread – they all participated in Camp Fire. We discovered this when we were perusing photographs from an album owned by Ruth Johns Anderson (we’ve blogged about Ruth’s son, Rod, and his letters home during WWII here, here, and here.) 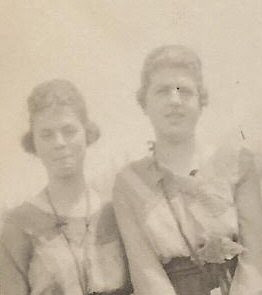 Imagine our surprise when we discovered a photo of Jo Cornick Ross and Ferol Tibbetts, two women whose paths didn’t really cross, seemingly examining and sizing each other up! Minnie Wilson Schomber was about 5 years old than Ferol and Jo, so she doesn’t appear in the photos. 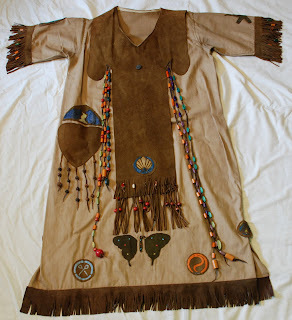 But we know that she was a part of Camp Fire because her uniform appears in our collection. 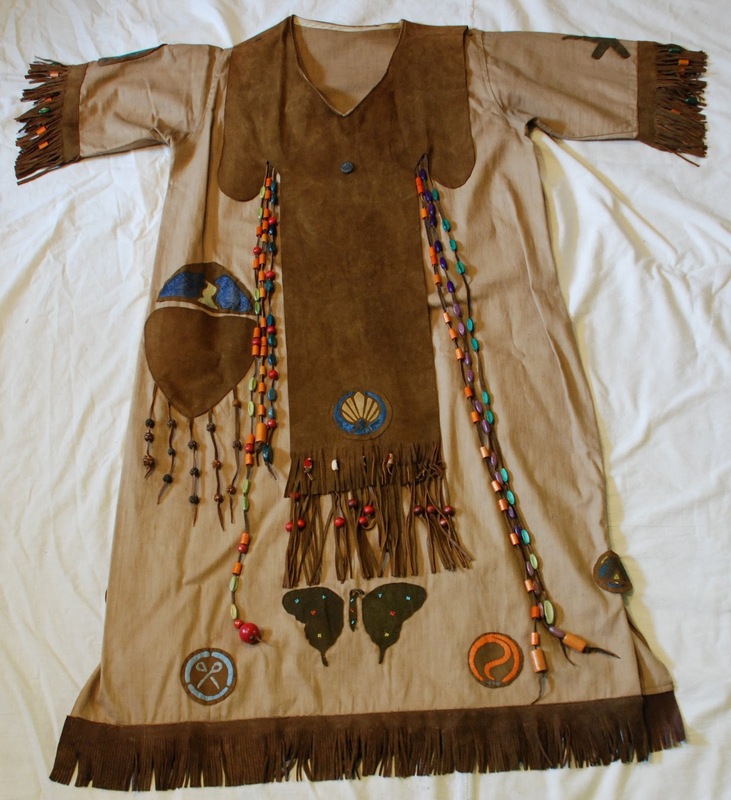 Her uniform has many patches, beads and a pin – some of which we can identify and some we can’t. The organization of Camp Fire became national in 1912 and the first handbook was published in 1914. It seems that there were general guidelines to creating patches and uniforms and a lot of creativity and personalization was encouraged. While no doubt most people in Issaquah’s paths crossed at one time or another, it’s always nice to be able to make a connection between people you’re researching. 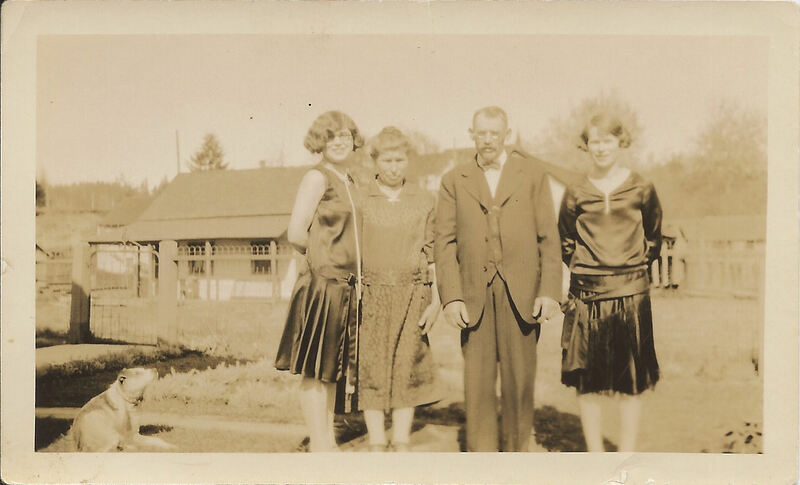 Jo, Ferol, and Minnie all led completely different lives but had very much in common (e.g., never having children.) Camp Fire Girls is just another part of filling in that picture. For more Camp Fire related records, click here. 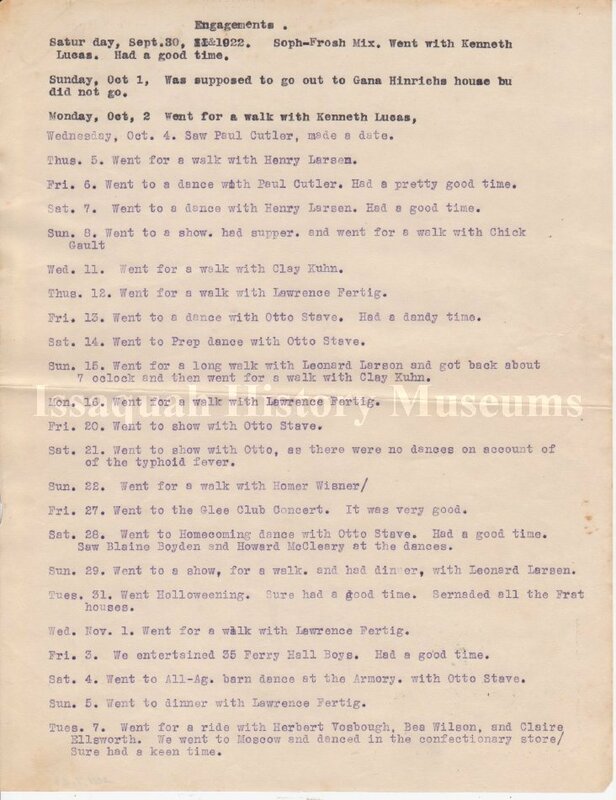 In our collection we have about 10 daily journals kept by Ferol Tibbetts Jess written starting in 1923. 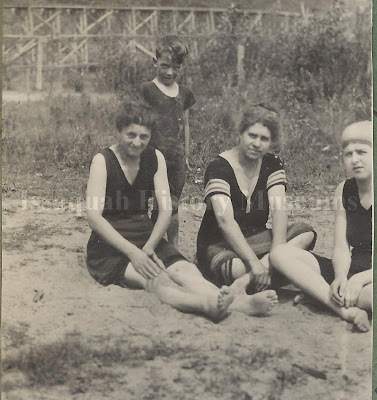 While the journals contain a lot of basic daily notes (sewing, washing, visiting friends) they also contain wonderful tidbits about what it was like to be a 20-something during the 1920s. “Bobbed my hair. Like it pretty well. Letter from Mother.” – College diaries, Mon, Jan 15, 1923. We have many pictures of Ferol Tibbetts, some pre-bob and others with her stylish bobbed and marcelled hair. Her exact date of when she cut her hair has allowed us to better date the pictures in our collections. 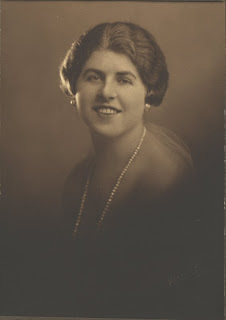 The earlier pictures of Ferol and her friends all feature the same hairstyle which seems to be a large pouf on top of the head and two small chignons over the ears. We much prefer the bob. Ferol’s chopping of her locks while away at school is something most college-aged women can probably relate to. 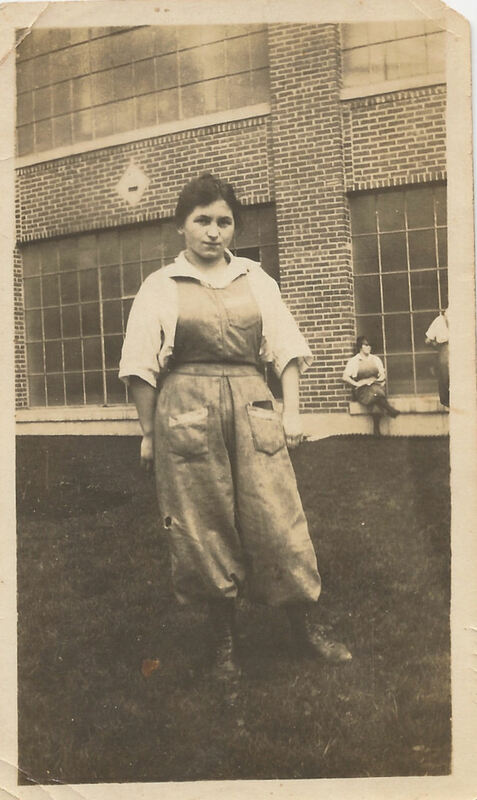 Luckily, Ferol came of age during a time when women were really changing what they did and said, what they wore, and how they spent their time. “Went to Renton with Mary and Tillie to get their hair marceled.” – Book I, Saturday, February 2, 1924. Pictures of Ferol with bobbed hair seem different than her earlier pictures – she smiles more and seems genuinely happy. “6:00am. Been sitting around talking to Walter since 3:45. Sure is a hell of a life I am leading.” – Book I, Sunday, July 22, 1923. One of the commonalities we’ve noticed between Josephine Cornick and Ferol Tibbets was their posession of personal cameras. In 1888, the Eastman Kodak Company released it’s first amateur camera. 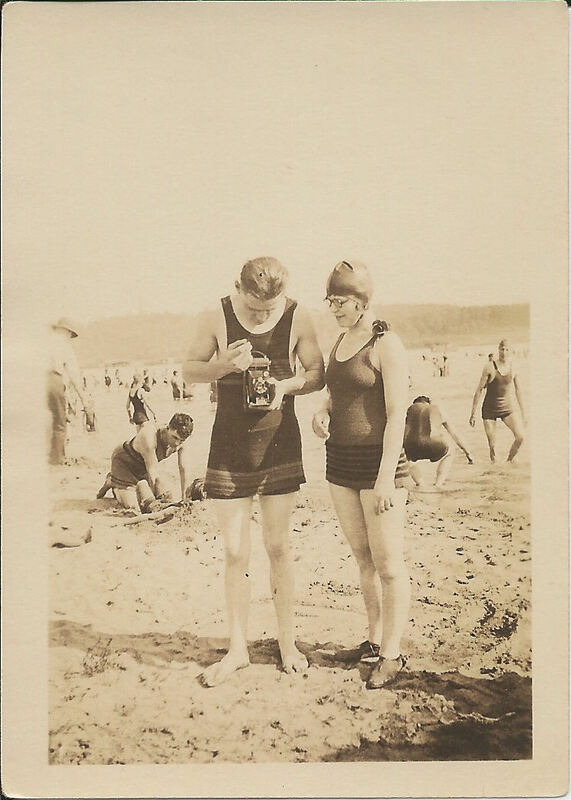 George Eastman’s goal was to make photography “as convenient as the pencil.” By the time Josephine Cornick and Ferol Tibbetts were old enough to shop for cameras, there were at least 8 different Brownie cameras available to the public for $4 or less. The more money you had to spend, the larger the variety of cameras available to you. The transition from studio photography to personal photography not only increased the number of photographic images the average person had as mementos — it increased the amount of information available from each image. Studio portraits required some investment, and families making that investment dressed in their best clothing and turned their best face to the camera. The final photograph was probably stamped with the name of the studio, but little else in the way of identifying or personal information. Personal cameras changed the way many people recorded their personal history. Instead of dressing up and trooping down to the local photography studio, camera owners could capture images from everyday life that had meaning for them. Looking at a series of snapshots, or an album filled with snapshots, delivers personal information in a way that studio images do not. Thanks to their snapshots, we can make some guesses about what Josephine and Ferol valued most based on the things they photographed — friends, pets, family members, automobiles. 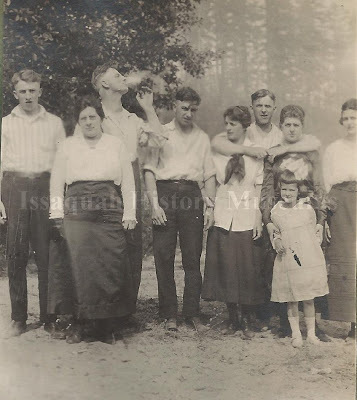 Snapshots were also used to preserve moments of good humor shared among friends. 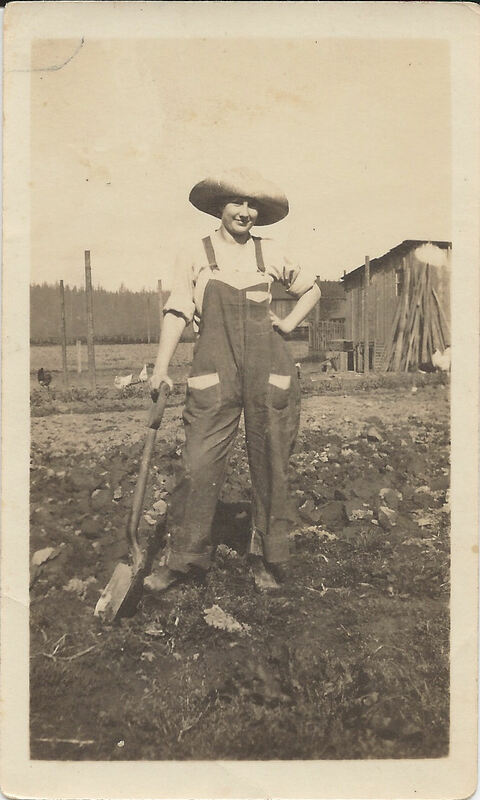 Snapshots also provide information about things we would never learn through studio portraits — like what girls’ gym uniforms looked like circa 1915, and how a young lady might have dressed to help with farm work. And we certainly don’t have any studio photographs of swimmers in their swim togs! The downside of amateur photography is, of course, the amateur behind the lens. Not everyone was adept with the new gadgets, resulting in the occasional botched image. But even in the case of this image, we can derive information from what Jo has written on the back. 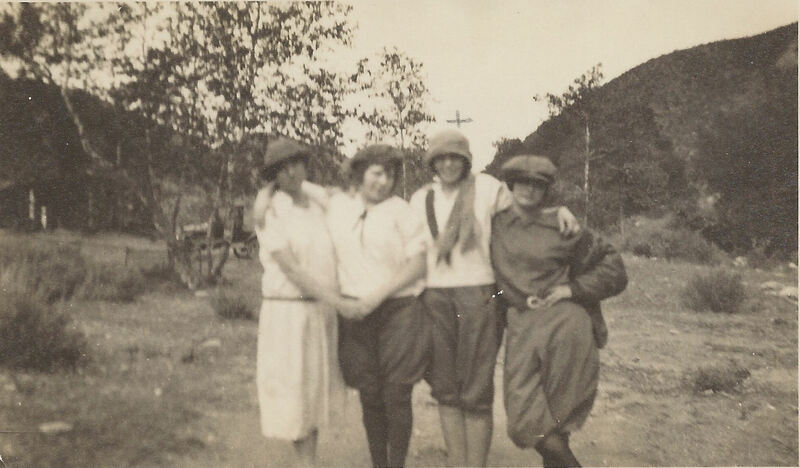 Even with the blurring, we can also tell that these four young women are all dressed in trousers. 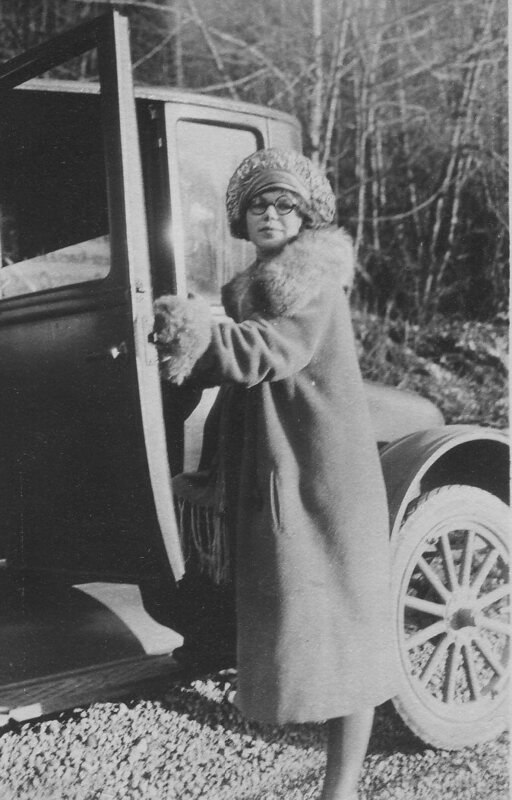 In 1979, Josephine Cornick Ross was 77 years old and lived at the Issaquah Villa nursing home. A student with a tape recorder interviewed her for a school assignment. 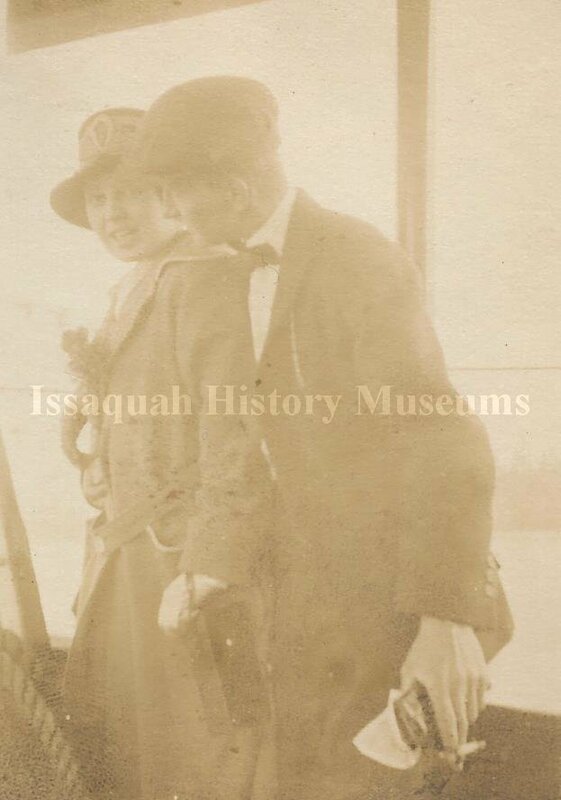 More than 30 years later, their 22 minute conversation found its way into the collection of the Issaquah History Museums. This recording is the only narrative we have about Josephine’s life that she herself created. 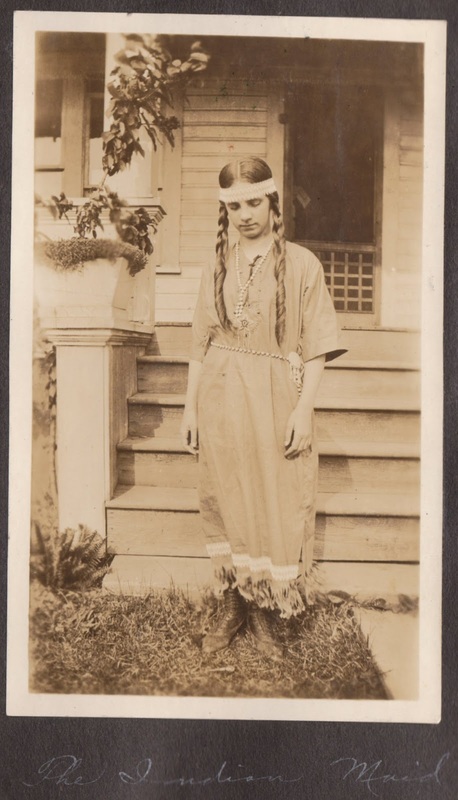 Unlike Ferol Jess Tibbetts and Minnie Wilson Schomber, whose letters and journals share details of their lives with us, we have only Josephine Cornick Ross’s photographs and brief oral history. For that reason, we have many more unanswered questions about Josephine. But, there are some things one can surmise even without a pointed narrative, and a fascination with automobiles is one of them. IN: When the car came, did it take Issaquah a while for very many people to get cars? JR: Oh, yes. It took quite a while. IN: Did your family used to travel to Seattle very often? IN: How long did that take? JR: Oh, it would take all day practically, by the time we got there and waited for the trolley, and then back again. 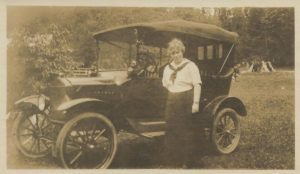 Although Jo’s family didn’t have their own automobile, her collection of snapshots includes photos of at least three different automobiles. They also share footage of a road trip to southern Washington taken with a few friends. Jo Cornick Ross opening the door of an automobile. Ferol Tibbets was born November 11, 1902 to George Wilson Tibbetts and Mattie Ray Tibbetts. The Tibbetts line had been in the Issaquah area since 1874 when Ferol’s grandparents, George Washington Tibbetts and his wife Rebecca Wilson Tibbetts, relocated here. Ferol Tibbetts was an only child. 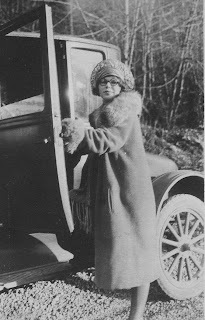 Her parents owned an auto shop and were probably considered part of Issaquah’s “upper class” society. A year after Ferol graduated high school in 1921 she attended Washington State College (Now Washington State University.) Judging from her diaries of her time there she focused on meeting boys and spending her time having fun. The few mentions of actual academic activities were mostly theater and drama related. 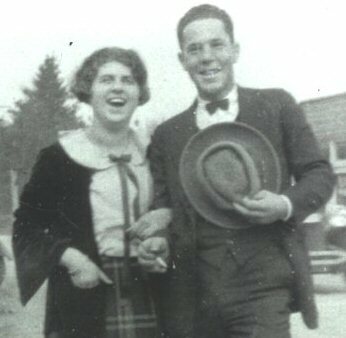 She moved back home to live with her parents after one year at college in 1923 – it’s unclear whether she ever graduated with any sort of degree. Our closest connection to Ferol and her life lies in her daily diaries. She began keeping journals during her year in college. When she returns home her journals pick up in simple composition books. 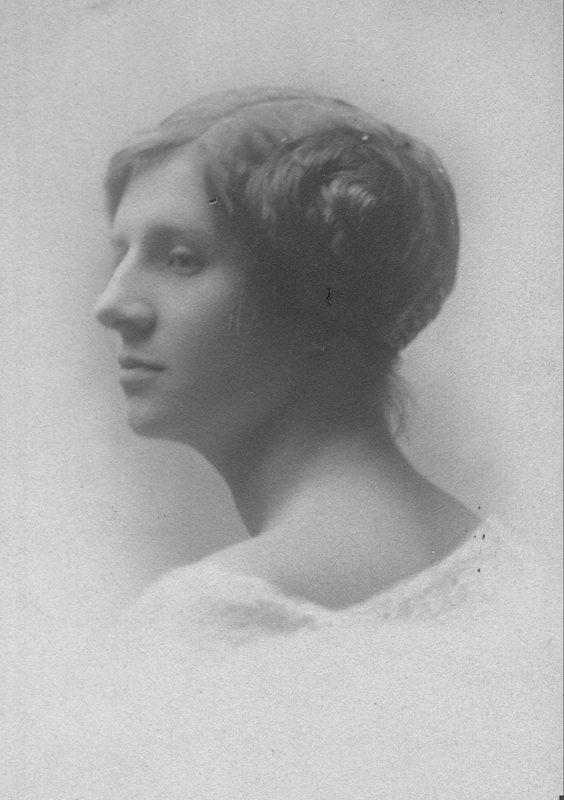 Ferol is fairly meticulous in her writings, however she often neglects to use last names which can make identification difficult. The wonderful thing about these journals is that Ferol began writing these while in her early 20s. 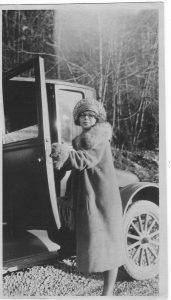 And since they begin in the year 1922 we’re able to see what “the roaring twenties” were like not only for a 20 year old female, but one who lives and has grown up in Issaquah. The diaries of hers in our collection continue for at least a decade and we haven’t hardly made a dent in reading and cataloging them. We’ll continue sharing our discoveries past the window of LHM. Who knows what we will find! May is Local History month! Local History Month is an opportunity for residents to consider the big themes present in the history of small places. Each community has its own weird, wild and wonderful stories that are unique to that place. Sharing these stories helps connect community members to their place, and also to each other, as public recognition of local history helps to foster local pride, maintain community character, and build a deeper sense of appreciation for the place itself. This year we are celebrating Local History Month by looking at life through the eyes of three young women who grew up in Issaquah. By coincidence, we happened to be researching all three ladies at the same time. Since they were all of an age, it was impossible not to start comparing them and seeing common themes. All three were born around the turn of the Century and came of age during the early 1920s. The 1920s brings with it images of flappers, jazz, Prohibition, dancing the lindy, flagpole sitting, silent films. 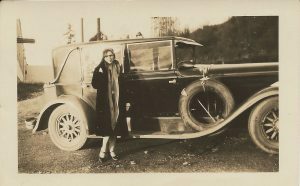 We wondered, how many of these tropes were true of life in Issaquah during the Roaring Twenties? Well, how many of us really lived like Don and Betty Draper during the 1960s? 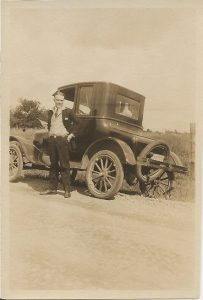 So we decided to get to know Ferol Tibbetts Jess, Josephine Cornick Ross, and Minnie Wilson Schomber and find out how they experienced the 1920s. The three were acquainted with each other — and, most likely, with most of the other residents of Issaquah, which was a small town of 1,000 people. 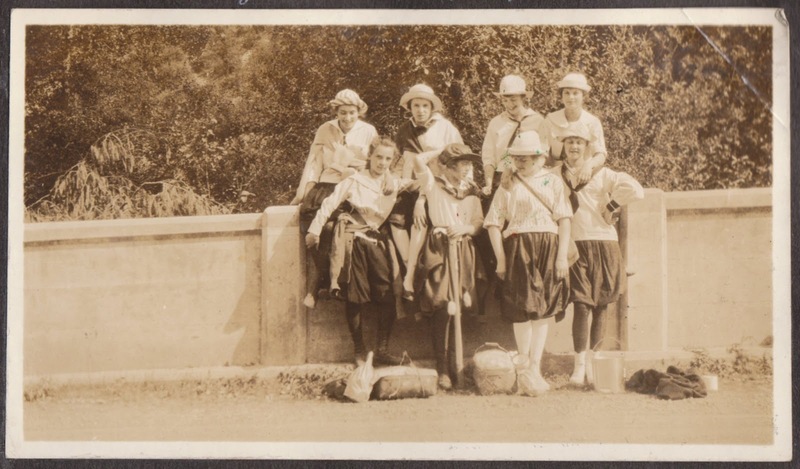 They were in many of the same organizations and service clubs together, and even appear in various photos together. All three worked at various times in their lives. None of them had children. They weren’t close friends with each other, however, which speaks to their differences. In order to get to know the ladies, we relied on photographs and documents from our collection, the contents of photo albums belonging to Ruth Johns Anderson and Ferol Tibbetts Jess, Minnie Wilson Schomber’s correspondence and diaries, Ferol’s diaries, the Issaquah Press and Seattle Times archives, and information from Washington State and King County archives. We’ll begin sharing images and information on Saturday, May 4. Stay tuned! In-depth cataloging of letters, journals and other documents was made possible by a grant from 4Culture. Yet another grant from 4Culture, along with generous support from individual donors, makes it possible for us to scan these items and share them through our Digitial Archives. May is local history month! All month long, we’ll be sharing bits and pieces of Issaquah’s collection, as well as tutorials to help you find local history on your own. Enjoy! Bill Evans was born in Issaquah in 1923 and lived here for most of his life. Both of his parents were from coal-mining families. 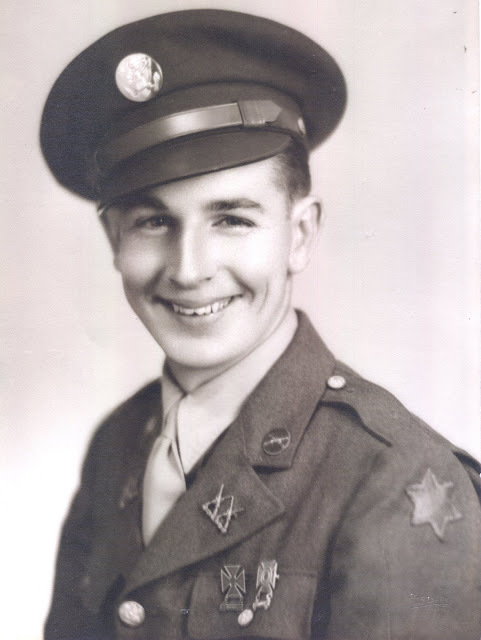 After serving in World War II, Bill lived in Seattle and went to college at the UW. Bill proved to be a sound and enterprising young businessman, and by the 1950s, he was living in Issaquah and operating his own business. Well-spoken, civic-minded, and forward-thinking, Bill was active in Issaquah’s Chamber of Commerce and helped shape the town we know today. Bill died in 2008. This excerpt from Bill’s 2006 oral history describes how Bill tried desperately to avoid serving in the Army during WWII. Although he looks pretty cheerful in this picture, Evans was determined to serve in ANY branch but the Army. Bill Evans: I tried to enlist. In those days, in 41, Walt [Seil] probably told you that he went to Pearl Harbor right after Pearl Harbor happened. We saw him off on the train to San Francisco because he went down there to catch a ship. …I didn’t want to get in the infantry. At the time, there was the Army Air Force and the Navy Air Force. I tried the Army Air Force first. I passed my mental test. And then, for some reason, they all took the mental test first. I guess to see whether you were as dumb as you look or what. And then they give you the [physical] test. Well, when I was twelve or thirteen, I got scarlet fever. I woke up in the middle of the night, probably two or three in the morning. I remember I turned on my light – I had the bedroom next to my folks’ bedroom – and I was covered with blood. This fever had built up so strong that it broke the blood vessels in my nose. I woke up, and I was soaking wet with blood from the fever. Scared the devil out of my mother. 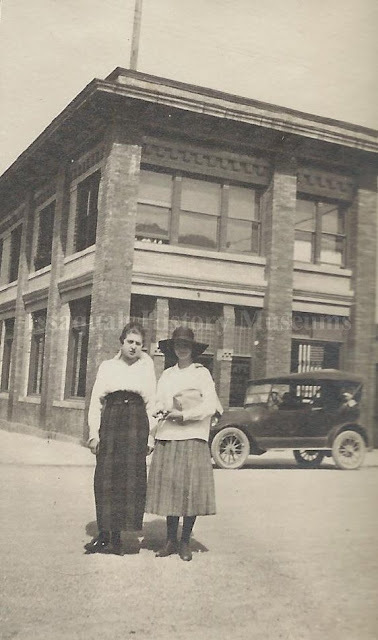 …The local doctor up in the bank building, which is now the bicycle shop cauterized the vessels in there with some kind of metal, heated iron, and stopped it. All it left me with, other than being a little on the puny side, with 20/30 in one eye, and 25/ or 30/ in the other eye. So later on, when I went to join the Air Force, I couldn’t get in because they demanded 20/20. So I tried the Navy Air Force. They gave me my mental test first. And then I tried to tell them, “You better check my eyes,” “Oh, we’ll get to that.” And I flunked out there. Then I went to the Coast Guard, and I flunked out there. Then I went to the Navy, and I flunked out there. All about my eyes, 20/30. I knew I was dead because I’d been in the State Guard. Teenage kids and old men were in State Guard. The only ones who weren’t drafted, or in the service. We wore coveralls, and we’d go out in the fields by Puyallup, and lay in the rain with a shotgun. We’d do close-order drill. … All they did was teach me close-order drill, which you learn in any camp, you know. I was going into the Merchant Marine because there used to be a butcher shop about two doors down from Fischer’s Meats. The father of this guy was in the Merchant Marine during the 30s. His son, who was a year younger than me, Don Finney, got in because of his father. He went from here, to Alaska, to Vladivostok, Russia and then back again. He was home every three months. I didn’t know when I’d see home if I got into the Army or something. So I thought, well, hey, that’s a possibility. I can be home. And I’d get double pay in Alaskan waters because the Japs had already infiltrated Attu, Alaska and so forth, way up north. Interviewer: How come you’d get double pay? BE: By carrying weapons and munitions and so forth. Dynamite. Anything that could blow up your ship. INT: Oh, so it was extra-dangerous. I said, “The Navy!” I thought, Boy, there’s life yet! So I went into a back examining room, went through the physical – most of the physical. And the mental, again. And I got to the eye exam. The room had been a classroom, and the charts that you’d close your one eye and look at were at the front of the classroom, hanging over a blackboard. Then you had to go down to the back of the room, turn around and take the eye test. I knew what was going to happen. So, I flunked. He said, “You stupid jerk. Why do want to get in the Navy?” He’d been in the Navy for so long, he couldn’t understand that. “Let me go back and take it again,” I said. So I was shipped from Fort Lewis to Camp Roberts, California, by Paso Robles. I went right into the infantry. When I get there, I thought, Ohgod, the worst possible thing that could happen to me now has happened to me. What happened then? Peruse the rest of Bill’s oral history to find out. Other stories in his oral history include his early childhood in the coal-mining town, his career as a medic in the Pacific Theatre, and how he fell in love-at-first-sight with his wife on a Seattle bus. Many of the research requests we receive revolve around questions about where things used to be located, or what the area looked like before. 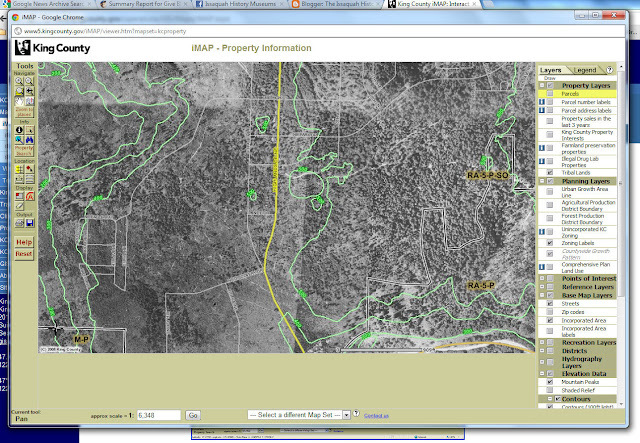 One of the niftiest features of the King County iMap is it’s ability to layer different information onto one map. 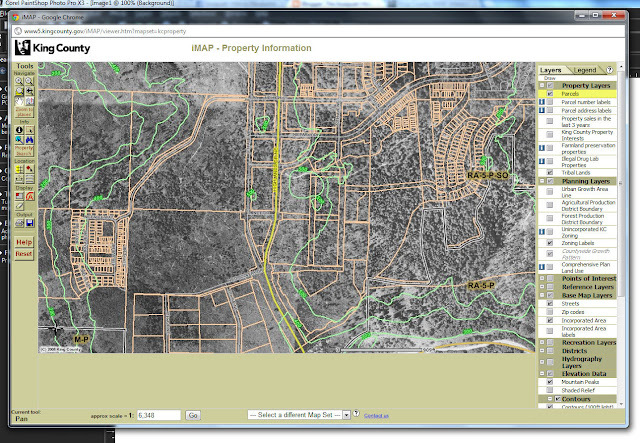 Using iMap, it’s possible to look at a current road (and parcel) map superimposed with the 1936 aerial image, to see what changes have occurred in the roads or landscape. 1. 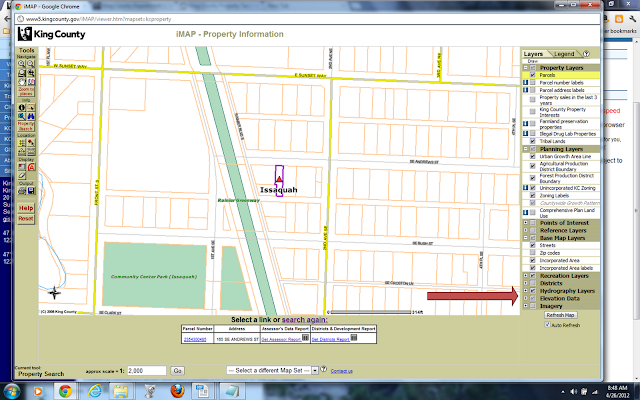 Start iMap and locate the property you’re interested in (see our previous blog post for more information on how to find a property using iMap). 2. Once you’ve found the parcel map for your property, take a look at the checkbox options on the left. You can experiment with these options to increase or decrease the amount of information that is layered onto your map. At the bottom of the list is “Imagery.” Expand this item so you can see your options. Select 1936 aerial view. 3. Here we see current parcel boundaries laid over a 1936 black and white aerial photograph. 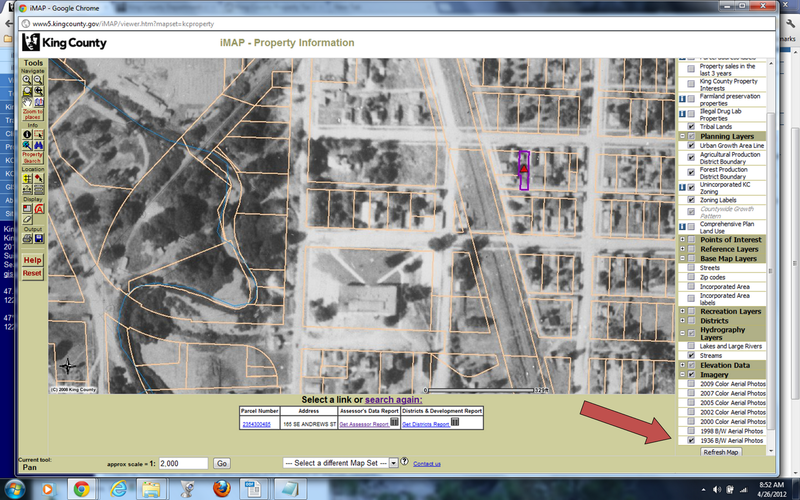 See that large property with the two diagonal sidewalks? This is the Issaquah High School in 1936. Today, the Issaquah Community Center is located on this lot. 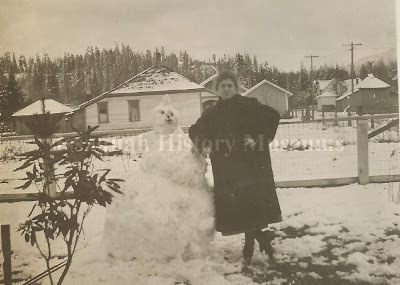 The Washington State Digital Archives are my favorite free online resource. You can access a broad range of records there, and many of them include an image of the record in question. And did I mention that they are free? A word of warning: the search is literal, and names are not transcribed with 100% accuracy. Just because you can’t find someone on the first try, that doesn’t mean they aren’t there. Try entering just the first letters of the name you’re looking for, and then browsing through the results for a likely match. This works for both first and last names. You can adjust the date range on many searches, also. 1. 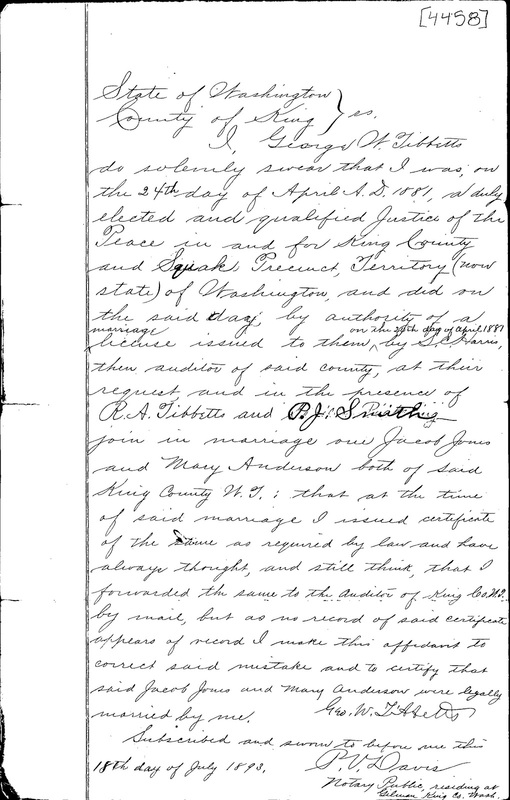 Marriage records. When we are cataloging photographs with the inevitable notation, “Mr. 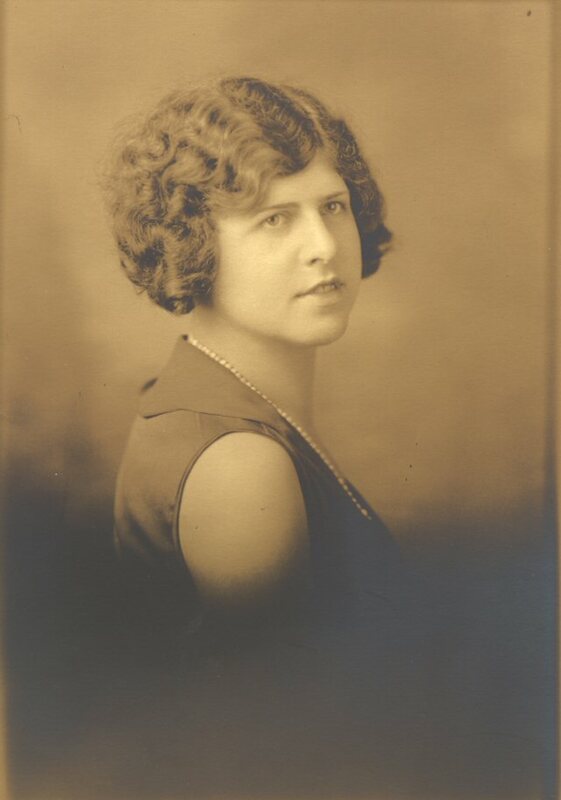 and Mrs. Frank Franklin,” it’s so nice to be able to go to WSDA, track down their marriage record, and find out that, yes, Mrs. Frank Franklin also had her very own name. There records are also very helpful when we’re trying to figure out how various cousins, aunts and uncles are related, or when trying to unravel the order of multiple marriages. You might also learn something new about whoever you’re researching by noting who witnessed the wedding (“stood up for” was how the newspapers often put it), or where the couple was married. 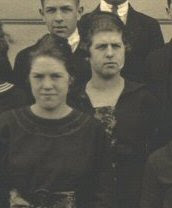 In the example at left, George W. Tibbetts, acting as Justice of the Peace, married Jacob Jones, Sr. and Mary Anderson. The witness “R.A.Tibbetts” was Rebecca Tibbetts, George’s wife. 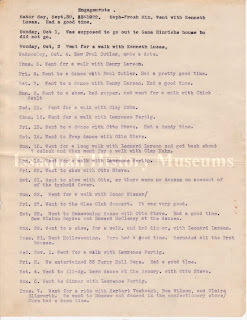 (For more about the Jones family, see this post). 2. Birth records. These handwritten records exist only for the period prior to 1908, when recording births became a function of the counties rather than the state. 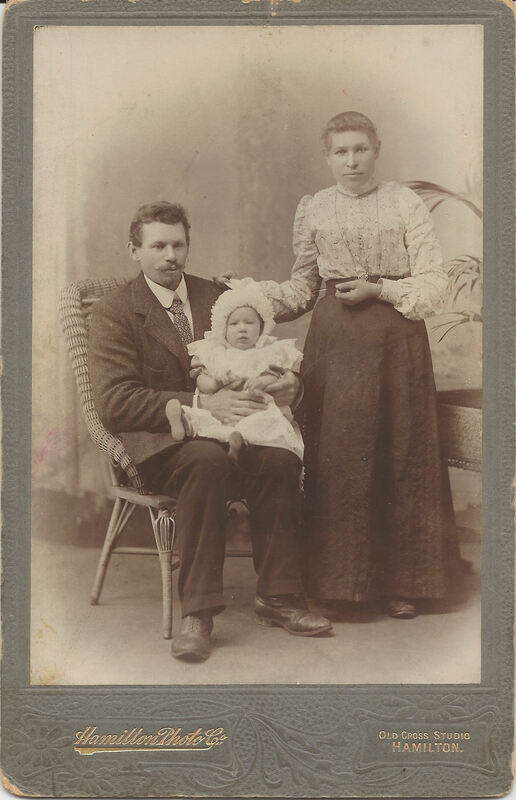 In the example at below (click to view at larger size), you can see that a child was born to Mary Albasini and Peter Pedrignana in March 1894. The baby girl was born in Gilman (which became Issaquah five years later). The age of both parents and their birthplaces are listed, as is the father’s occupation (coal miner, in this case). In the next to last column is the name of the person who delivered the baby. In the case of Baby Girl Pedrignana, Dr. W.E. Gibson was on hand for the delivery. Doc Gibson attended the birth of hundreds, possibly thousands, of Issaquah babies over the course of his 50+ year career in Issaquah. Baby Girl Pedrignana grew up to become Eugenia L. Pedegana, her parents having simplified their last name within a few years of her birth. One tip – when you’re looking for a birth record, search for the name of the father or the mother (or both). Most babies were not named at the time their birth was registered, but parent names have been indexed. 3. Death records. There are two kinds of death records listed: those from the Social Security Death Index (which include birth and death date) and Washington State death records (which includes parent names, spouse names, age, date of death, and place of death). As with birth records, indexing is fallible so experiment with various name spellings before you give up. 4. Frontier Justice. This collection of records references court cases held in Washington Territory. Most of the cases deal with things like collection of debt, conveyance of deed, and the occasional divorce, but they often raise interesting questions (for example, were holiday meals impacted when Pete Reppe took his cousins to court for failure to pay his wages?). Documents from individual cases are not available, but the information you’ll need to find the files is. 5. There are a number of places to access free census records. The WSDA is one of these. 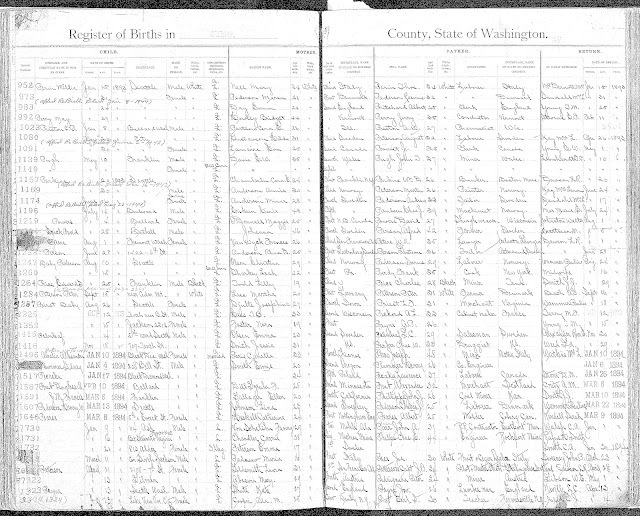 Although other sites might have snazzier searches available for the census, it’s nice to be able to search Washington State records and the census records at the same times. 6. Many others. Browse around and you’ll find incorporation papers, naturalization paperwork, and military registration forms. 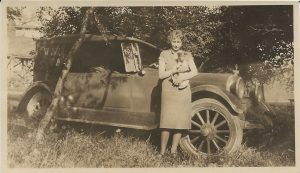 Do you have any state archives discoveries you’d like to share? Tell us about them!